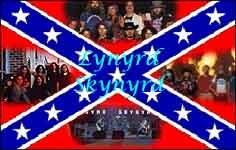 Welcome to my Lynyrd Skynyrd Tribute website. Lynyrd Skynyrd is no doubt the best Southern Rock band ever. I was quickly taken over by Skynyrd's style and songs. I had heard Sweet Home Alabama numerous times, and loved it, however, I didn't know who sang it. Then while on a school trip I heard that song and found out who sang it. Next I heard Free Bird, and I was instantly hooked on Lynyrd Skynyrd and Southern Rock! Skynyrd has that special power and feel that makes their music truly music for your ears. Here's a picture you can use for whatever purpose (247K). My first Lynyrd Skynyrd concert. That was sooooo much fun! Now there's a whole page of links. How about visiting my Southern Rock Page? What's your favorite Skynyrd song? Tell me here. Thanks. What other bands do you like? Here's a few pages of other bands I enjoy listening to. is owned by Ben Butler. Want to join the Ring Of REBELS?